Dillons Premium Fitness Training Helping busy professionals and parent to prioritise their health & fitness. 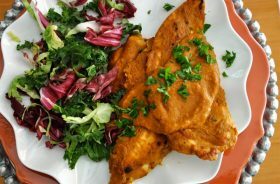 Serve this flavourful Southwestern Chicken Dinner with a side of dark leafy greens. This is the epitome of a meal focused on protein and fibre. It’s meals like this that will melt off body fat and improve your health and fitness. Enjoy! 2. Place the coconut oil in a frying pan over medium heat. Add the chopped onion and sauté until soft, about 5 minutes. Add the remaining ingredients and continue to cook for about 10 minutes. Use a hand blender to puree the sauce until smooth. One serving equals: 304 calories, 17g fat, 336mg sodium, 5g carbohydrate, 1g fibre, and 18g protein. I hope that you get a chance to give this recipe a try this week. Remember that I’m only a call or email away to assist you in all things fitness. And if you are not yet one of my prized clients then click here to book in a discovery call with me– I’d love to help you achieve your best body ever! © 2019 Dillons Premium Fitness Training. All Rights Reserved.